Rick Owens clean lines, elegant draping on simple dresses, they have a very casual laid back feel , reflecting their Los Angeles , a mix of glam and grunge—“glunge”, as Owens calls it with its black and dirty putty colouring. 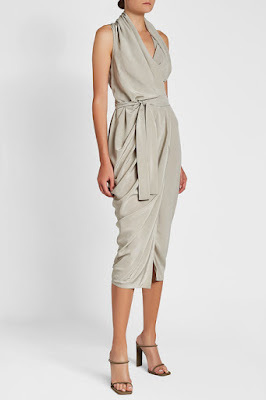 In putty-beige grey with a sensual draped finish, this shoulder-baring dress from Rick Owens is a chic and contemporary style in pure silk. The asymmetric hemline keeps it edgy while the nipped-in waist promises it's a flattering statement. Rick Owens' black bustier dress is a versatile addition to any closet - and with oodles of confidence to go with it. As sculpting and chic as it is sensual, the longer length keeps it polished. Shrug on a biker and add vertiginous heels to channel the label's tough-luxe aesthetic. A versatile style in ash grey, this figure-forming dress from Rick Owens is statement with a tough-luxe zip down the back. From the daring V-neck to the flattering silhouette - it promises to take you from edgy day looks with boots to party nights with sandals.